Today I am going to teach you how to crochet! I realize videos would be better, but I dont have that much time or space on my computer! We are going to be making either a scarf or a dish cloth- either is equally easy, but obviously the scarf will take longer because it is at least 6 times longer, so you may want to try it for a second project! 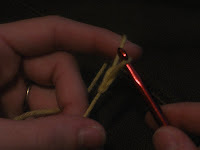 As for hook size and yarn, it really doesnt matter for this progect, but I would say to go with a RED I sized hook. Go to yoru local craft store or Walmart and ask someone how to find one. Then you will be able to tell where the sizes are and the differences once you have looked at them! So here we go, lets get started! 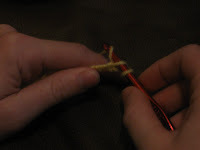 Start with your yarn in your hand like this. You are going to make a slip knot. 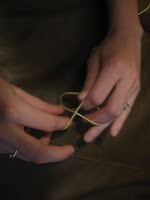 wrap it around your fingers and pull it through. Now stick your hook it in and pull it tight. 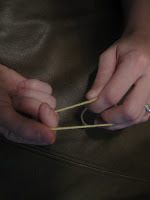 Now you will take your hook, wrap your yarn over top of it and pull it through the loop. This is called a chain! Continue until you have your desired size. Which is 30 stitches for a wash cloth and 20 for a scarf. You now have a chain! 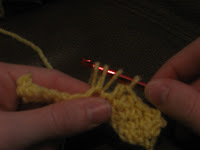 You have just done your first SC or single crochet! You are now crocheting! WAY TO GO! Keep doing this down the entire row. 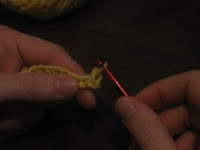 Then make 1 chain stitch and turn your work. 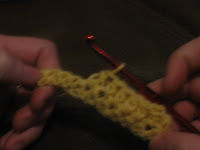 Now you will do your first HDC or half double crochet- Wrap the yarn over your hook and put your hook through the next loop in your work. 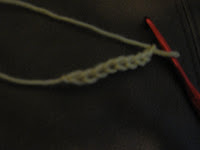 Wrap the yarn over one more time and pull through the loop in your work. You should have 4 loops on your hook. Now pull the last loop (The last one you just wrapped) through all 3 of the other loops. 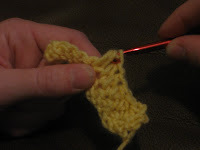 You have just done your first HDC or half double crochet! Now comes the DC or double crochet! 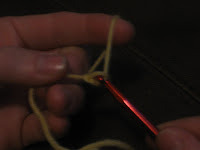 Wrap the yarn around your hook, put it through the next loop, pull through. You will have 4 loops on your hook. Now pull through 2. Then wrap again and pull through the last 2! You have just completed your first DC or double crochet! Now I want you to continue in a pattern of a row of single crochets, a row of half double crochets and a row of double crochets until you have your desired length! Look at you! You are crocheting!! 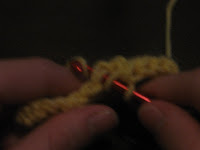 Come back next Thursday for a lesson on tripple crochets, how to crochet in the round and how to read a pattern! WOW, I can chain and single stitch, but I refused to listen to my mom when she tried to teach me anything as I thought that IF I didn't learn that she wouldn't pass away on me. Now I wish I had of listened cause I don't understand a thing that I read, but I actually understood what you were saying. Thanks. Thank you for doing this! 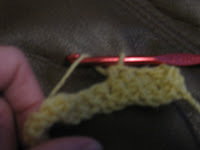 I have been wanting to learn how to crochet now that I am getting knitting down but have been unable to find a tutorial that I think that I could handle. This one DEFINTIELY looks helpful! What a great tutorial! It was so clear and encouraging. Thanks so much. Could you guys really understand it? I hope so because to me it is so straight forward- if you have ANY questions let me know! How nice of you to share this. Love how you are so sweet as you taught. 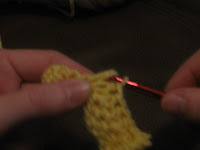 Nice to find a tutorial on crocheting, just taught myself to knit. Not that I need to add more to my ever-growing list of addictions. 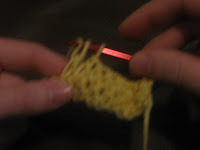 My mother never had the patience to teach me to crotchet. Thanks! Great tutorial! I hope that it helps other learn to crochet! Great tutorial Josie! 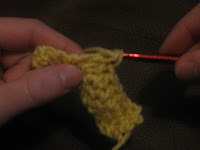 How long would you say it takes to crochet a dishcloth if you are fairly slow? I was thinking of making some for Christmas presents. 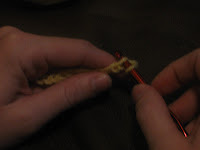 I love all your Wordless Wednesday pics - how fun!! Your little one has fabulous curls! 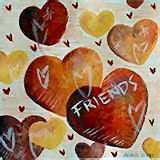 Come enter my contest- PLEASE! Great giveaway I want to win! A fun way to make someones day!